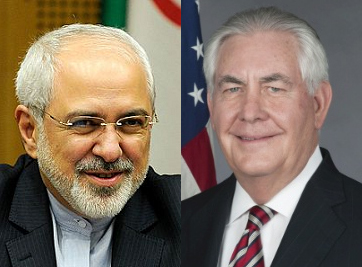 On September 20, Secretary of State Rex Tillerson and Iranian Foreign Minister Mohammad Javad Zarif met for the first time. E.U. foreign policy chief Federica Mogherini chaired a ministerial meeting on the implementation of the nuclear deal, also known as the Joint Comprehensive Plan of Action (JCPOA), on the sidelines of the U.N. General Assembly. Foreign ministers from all of the countries party to the agreement —China, France, Germany, Russia, the United Kingdom, the United States, and Iran — attended. After the gathering, Tillerson told reporters that it was “a good opportunity to meet, shake hands” with Zarif and “the tone was very matter-of-fact, there was no yelling.” He added, jokingly, “we didn’t throw shoes at one another.” But Tillerson also emphasized that Washington and Tehran see nuclear deal very differently. The following are remarks by officials following the meeting. SECRETARY TILLERSON: I know you want to get to your questions quickly, so I’m not going to make a long number of comments, just to make a couple of remarks. I did just come from a meeting of the parties responsible for the JCPOA, the Iranian nuclear deal. This was a ministerial-level meeting that the EU high commissioner convened so that we could have an exchange of views around the table of all the parties to the agreement as to how implementation is performing. It was not a technical discussion; it was a political discussion of the political aspects. So we had a very open and candid exchange of all of the parties to that agreement. I think it was – I hope it was useful to others. I found it useful to hear their perspectives. I hope they found it useful as well. We clearly have significant issues with the agreement. The President’s been quite clear and articulate as to his concerns about the agreement itself, the thoroughness of the agreement, the enforcement of the agreement. And I think, really as he has said and I’ve said many times as well, that when look – when one looks at – he uses the word “spirit of the agreement,” I use the word “expectations of the agreement” – that even contained in the preamble of the agreement there’s a – there was clear expectations of the parties who were negotiating this nuclear deal that a conclusion of the nuclear agreement, which set aside, obviously, a serious threat to the region and to the relationship, and that by doing so this would allow the parties to seek a more stable, peaceful region. That was the expectation of the parties. And regrettably, since the agreement was confirmed, we have seen anything but a more peaceful, stable region. And this is the real issue. And that’s why we talk about Iran defaulting on these expectations, because those expectations clearly have not been met. Since that time, Iran has continued to prop up the Assad regime and its horrible way in which it has brought violence to its own people. They have continued to engage in malicious cyber activity. They have aggressively developed and tested ballistic missiles in defiance of UN Security Council Resolution 2231, thereby threatening the security of the United States and the stability of the region. They’ve provided weapons and training forces to deploy to create instability throughout the region in Yemen, in Syria, and in Iraq. And I think we even see them carrying out provocative operations in the Gulf itself against our naval and coalition vessels as they try to peacefully transit the Gulf, threatening the very freedom of navigation through this very important waterway. So I think it’s pretty difficult to say that the expectations of the parties who negotiated this agreement have been met. Perhaps the technical aspects have, but in the broader context the aspiration has not. So recently, the U.S. has taken action to counter those activities. As you know, additional sanctions were recently put in place to deal with the ballistic missile testing, the cyber activity, these other destabilizing activities. And we’re going to continue to monitor Iran’s activities and we will take additional steps, none of which put us in any way contrary to our – or are contrary to our obligations under the JCPOA. We are fully compliant with the JCPOA. The activities we are sanctioning Iran for carrying out are not covered under the technical agreement, the JCPOA itself. But I think in particular, the agreement has this very concerning shortcoming that the President has mentioned as well, and that is the sunset clause, where one can almost set the countdown clock to when Iran can resume its nuclear weapons programs, its nuclear activities. And that’s something that the President simply finds unacceptable. All of you are keenly aware of the circumstances we’re dealing with with North Korea. When we look at the history of North Korea’s weapons development program, in many senses we’ve seen this before – agreements that just simply pushed it to another government, another administration, to deal with. The President has made it clear he doesn’t intend to do that in this case. He takes his responsibility in this particular matter quite seriously, and that is the reason he is very, very carefully considering the decision of whether we find the JCPOA to continue to serve the security interests of the American people or not. We expect Iran to fulfill its commitments. We’re going to – until that time, we’ll fulfill our commitments, and the President has the matter under consideration. So with that, let me stop. That’s the most recent event I came from. There have been a number of UN-related events, and I’m happy to do the best I can to address questions you may have around the many, many activities that are going on. And I’m going to allow Heather to referee for me. QUESTION: Mr. Secretary, the President said this morning that he had actually made a decision on what to do about the Iran nuclear deal, and I’m wondering, one, if you can share with us what that decision is. And secondly, about the meeting that you just came from, the European foreign policy chief, Ms. Mogherini, said that all the members, all the parties who were there, agreed that the deal is working towards its purpose. And from what you said just now, you don’t seem to fully agree with that. So is she – is that characterization from her correct or not? SECRETARY TILLERSON: First, as to the President making a decision, as he indicated earlier I think in a press avail or spray somewhere that he had made a decision – he has not shared that with anyone externally. Prime Minister May asked him if she – if he would share it with her, and he said no. So I think, as the President has always indicated, he will let you know when he thinks it’s useful to let you know, and he doesn’t share his forward planning with people. But he, I believe, has made a decision. With respect to the high commissioner’s characterization of the meeting, I think, again, it’s important to think about – and I don’t want to go into a lot of detail of our discussions out of respect for the way we agreed we’d treat those discussions – from a technical standpoint, the IAEA reports continue to indicate and confirm that Iran is in technical compliance of the agreement, and no one around the table took exception to that. The political side of the discussion is what I shared with you, and so I think the high commissioner was reflecting the rigid and strict contours of the agreement itself. QUESTION: Mr. Secretary, you made the correlation between North Korea and Iran, so if I could follow up on that. First of all, you said the other day that North Korea was starting to show some effects of the sanctions. Could you expand a little bit on that? What are you seeing so far? And when you say – when you talk about the deal – that you want an agreement with North Korea, and then you seem to kind of move the goalpost a little bit on Iran, I mean, I think your counterparts would say that yes, that the expectation was always there that this might – and the hope, I think, that Iran would improve its behavior, but that was never written into the agreement. And so what do you say to those that are concerned that if you – why would North Korea make an agreement with the United States if it’s going to go back on its word and its – on its agreement, and does this hurt the credibility of the United States in making deals in the future? SECRETARY TILLERSON: Well, I think in terms of an agreement that we would strike with North Korea would be of a very different nature than the Iranian JCPOA, which by its title is a joint commission plan of action. It doesn’t even contain the word “agreement” in its title, and this is one of the challenges. So what we really have is a plan that was – that then was agreed and memorialized. We – again, we would take a very different view of the nature of the North Korean agreement. And it is because while the threat is the same – it’s nuclear weapons – the issues surrounding North Korea are very different than the issues surrounding Iran. Iran is a large nation, 60 million people; North Korea is a smaller nation, the hermit kingdom, living in isolation. Very different set of circumstances that would be the context and also the contours of an agreement with North Korea, many aspects of which don’t apply between the two. So the threat’s the same, but the nature of the agreements are going to be quite different in terms of what’s necessary to achieve the objective: a denuclearized North Korea, an Iran that never pursues nuclear weapons. So the endpoints, obviously, are the same, but the elements that allow you to achieve that are very, very different. QUESTION: On the North Korean sanctions? SECRETARY TILLERSON: We are – we have some indications that there are beginning to appear evidence of fuel shortages. And look, we knew that these sanctions were going to take some time to be felt, because we knew the North Koreans, based on information that the Chinese had shared with us and others had shared with us, had basically stockpiled a lot of inventory early in the year when they saw the new administration coming in in anticipation of things perhaps changing. So I think what we’re seeing is a combined effect of these inventories are now being exhausted, and the supply coming in has been reduced. But there are indications that there are shortages, of fuel in particular, and I think we will see latent evidence of the impact of the other sanctions that have been put in place. QUESTION: Mr. Secretary, this was your first encounter with the Iranian foreign minister, Mr. Zarif. How did that go? Is there – do you – given the deep concerns you have about Iran’s behavior, do you think their officials are people that you can negotiate with? SECRETARY TILLERSON: Well, the Iranian people – first, let’s talk about the Iranian people – are a very well educated, very sophisticated population, so their leaders similarly are well educated, very sophisticated. And Foreign Minister Zarif certainly is in that category. So yes, the – whether we can agree, that’s another thing. We certainly have – we have very different views of this relationship. And I think in many respects, one of the great challenges for us is coming to some understanding of what defines this U.S.-Iran relationship. Because it is not a – it’s not a particularly longstanding relationship. It’s only been in – the current relationship in place for about 40 years. It was borne out of the revolution with our embassy being seized; it’s been scarred by terrible attacks against our men and women in uniform, enabled by Iranian capability. So this is a very – it’s a relationship that’s never had a stable, happy moment in it. And I think if we ever get the chance to talk, perhaps that’s where we ought to start talking, is: Is this going to be the way it is for the rest of our lives and our children’s lives and our grandchildren’s lives? And we’ve never had that conversation. So I don’t know. We’ll see. It was a good opportunity to meet, shake hands. The tone was very matter of fact, it was not – there was no yelling, we didn’t throw shoes at one another. It was not an angry tone at all. It was a very, very matter-of-fact exchange of how we see this agreement very, very differently. QUESTION: Secretary Tillerson, why is Mr. Trump – Mr. Trump keeps suggesting that he’s going to kill the Iran deal, but he won’t tell us exactly what he – why is he stringing this out and why is he speaking of the agreement in the way that he is? SECRETARY TILLERSON: All in due time. QUESTION: Well, why not go in and say what the decision is now rather than keep people in suspense? SECRETARY TILLERSON: Well, there is additional work that goes with that decision, so – I mean, yes, it’s very easy to make a unilateral decision, just say, “I’m doing it,” and then let the cards fall where they may, let the dust hit the ground where it hits – but in terms of how do we want to prepare ourselves and others for a decision. So I think – and I think the President, I think he’s going about it in the correct way. He’s being very deliberative. He has heard all – he’s heard the arguments from both sides. If no one wanted to make that argument, then someone would put that case together and say, “But we have to think about it from this perspective.” He’s listened to all of that and I think we’ve had sufficient time to get our own kind of direct understanding of this agreement and how it functions and see how the implementation works, see how the IAEA works. And so I think – I think the time has come for a decision to be made, and it is the President that has to make the decision, and he has really considered the input, thinking about it from all the angles. And so I didn’t know he was going to say today he’s made a decision. I knew he had, but I didn’t know he was going to say he had. (Laughter.) So if he had just not said that, you wouldn’t have been asking me this question. QUESTION: President Rouhani said today there would be no alterations to the existing deal and that it would be, frankly, a waste of time, he said, to talk to the Trump administration about a new one. He also said the Iranian people deserve an apology for President Trump’s insulting UN address. All of this together looks like the atmosphere to diplomacy is getting worse. How do you respond to this? SECRETARY TILLERSON: Well, first, as a longtime negotiator, I learned to never say never. And second, it always gets the darkest before you might have a breakthrough. QUESTION: So you think one is possible? SECRETARY TILLERSON: As I’ve said to people many times, as the nation’s chief diplomat, I better be the most optimistic person standing in the room. QUESTION: Let me just throw one more question in. QUESTION: You said you had a matter-of-fact conversation with your Iranian counterpart. Can you envision having that kind of a conversation with North Korea? SECRETARY TILLERSON: I’ll take the second question first. I don’t know whether I can have the same kind of a matter-of-fact discussion with North Korea, because we don’t know how their means of communication and behavior will be. We do have – we have very, very limited contact with their representative here at the UN from time to time, but how the decision maker or the people that are closer to the decision maker are going to behave is something we will have to understand and learn, so I can’t really answer that question. The first part of your question was? SECRETARY TILLERSON: Yes. Well, we – look, the allies have known, because President Trump – this was – he has talked about in his campaign, he’s continued to talk about it every time the – we had to come up on the 90-day certification. He’s talked about it. So we have been in discussion with our allies for quite a long time, and I have been in contact with my counterparts, including I’ve been in contact with heads of state that are signatories to the agreement. It was on – up for discussion when I was in London last week. So we’ve had a lot of exchange over what – how would they view this, how would this affect them. One of the things that we – and I mentioned all these other activities of Iran that we think really do violate the expectation and that we are sanctioning them for those. We also have been making the case to our allies that you share our concern about Iran’s behavior; please join us in sending that strong message to them, and you’re not violating the agreement. And I think they are looking more carefully. I think there’s been a bit of a hesitancy because of their commitment to the agreement to think about sanctioning some of these same activities. We believe they’re now looking more carefully and seriously at that as a means to push back on this other behavior of Iran’s that they agree with us is just simply unacceptable. So in answer to your original question, there’s been a lot of dialogue about it, a lot of discussion. So we’ve heard from them; they’ve – and we’ve listened a lot to them as we’ve walked up to making our own decision. "We raised our objection about a number of instances in which the new U.S. government has failed to abide by its commitments under the deal, as well as the remarks made by some American authorities that we have found inappropriate. We also discussed JCPOA regulations, some of which could be interpreted as violations of articles 26, 28 and 29." "We talked about the U.S. failure in implementing its JCPOA-related commitments. All government representatives present at the meeting stressed on the full implementation of the nuclear deal from all parties." MOGHERINI: Good evening. Good to see you. I just chaired a meeting of the Foreign Ministers of China and the Russian Federation, the United States, France, Germany, the UK and Iran, during which we discussed the implementation of the nuclear deal with Iran. QUESTION: Representative Mogherini, was there a discussion of the sunset clause or ballistic missiles on the part of the United States or anyone else? Did you agree to any discussion of changes? MOGHERINI: No discussion on changes. As I said, we're talking about a UN Security Council resolution. I would like to read to you, if I can, because sometimes we forget what the text is about. I'm glad to provide you the full one hundred and four pages we negotiated for more or less 12 years. I guess this is already an answer to your question about renegotiating parts of it. Point three of the preamble - so the very beginning of the agreement says: Iran reaffirms that under no circumstances will Iran ever seek, develop or acquire any nuclear weapons. There are some provisions in the agreement that have a temporary duration. There are other provisions that have no temporary limit - that are forever. And there is in any case the commitment of Iran as a member of the Non-Proliferation Treaty that stays and I think that point three of this very beginning of the agreement speaks for itself. QUESTION: You said that there were issues that were not within the scope of this agreement. How will these issues be discussed - in what format? And is there any room in your view, to reopen the JCPOA, to discuss some of these other issues of concern. And if not, why not. MOGHERINI As I said, the agreement is working and is delivering for its purpose, for what's in the agreement, which is a nuclear non-proliferation agreement. And let me underline one thing that must be self-evident to all in the world, I think, in this moment having a nuclear non-proliferation agreement that is delivering is quite a strategic instrument in the hands of the international community. It's not an irrelevant part of global security. QUESTION: President Trump said today that he had made up his mind about the nuclear deal. Did you get any indication from Secretary of State Rex Tillerson what that decision was? And also, when you say all of us agreed did the US also agree that Iran is in full compliance? QUESTION: Did the U.S. commit to remain in the agreement? MOGHERINI: We are discussing. But let me tell you one thing, because again, we have worked for 12 years on this and every single word - starting from the title - has a meaning. And in this you will find a part on the dispute resolution mechanism. If there are problems of non-implementation, by any of the sides, we have a mechanism to gather at deputy’s level or ministerial level, we have some four weeks to find solutions - and as I said it's a UN Security Council resolution. So, don't imagine that one country does, or dismantles the agreement. This is a UN Security Council Resolution. QUESTION: Was there a discussion at all that if US leaves, what happens to JCPOA after that? MOGHERINI: No, we didn't discuss that. But I can tell you, as Europeans, here I'm not speaking on behalf of all the others - I'm speaking for the European Union - as Europeans we will make sure that the agreement stays. "It is in our utmost interest not to jeopardize the nuclear agreement with Iran and certainly not to end it now or in the future." "We have seen that the agreement is working." "I firmly believe that neither the volatile and tense situation in the region nor Iran's conduct would improve if the agreement is no longer observed."